Germs! You have to be careful about germs! There are germs that can spread infectious diseases spread all too easily. The spray of droplets during coughing and sneezing can spread an infectious disease. You can even infect another person through droplets created when you speak. Because some organisms can live on objects for a short time even touching an object, such as a doorknob, a handrail, a bathroom faucet, soon after an infected person has touched it might expose you to infection. Some of us are very germ conscious, germaphobes if you will, others of us, not so much. The fear of catching sickness is a very real fear and that fear can get in the way of helping those who are sick. The society in which Jesus lived was very conscious of disease control and they had strict rules to manage people with infectious diseases. Once it was determined that one could have an infectious disease that one was declared unclean and he or she needed to stay away from everyone else so that the disease didn’t spread. Understanding this is what makes the story we read in Mark’s gospel so fascinating. The story picks with Jesus returning to Capernaum after being on that boat ride we talked of last week. When he gets out of the boat he is mobbed by people. But Jairus one of the leaders of the synagogue pushes his way to the front of the crowd and begs Jesus to come with him to heal his daughter who is close to death. So Jesus accompanies him on his way back to his house. The whole crowd is following him. But there is someone in the crowd who isn’t supposed to be there. There is this woman who has a hemorrhage of blood. You see, because of her hemorrhaging, she was unclean. She is not supposed to be out in a crowd, and she is certainly not supposed to be touching anyone. In fact, she is not allowed to married. If she had been married the man was required to divorce her or at least separate from her. She was as much an outcast as a leper would be. She was unable to go to the synagogue; to the market; into any town streets, in fact, anywhere where there were people. According to Jewish purity laws she was to be treated like we treat people who have tuberculosis. We put them into quarantine. She had tried to get better. She had tried to go the doctor route. But as Mark said, she had endured much under many doctors and spent all that she had and was no better. From Jewish writings, we learn of some of the cures that were used to stop bleeding like this. One of the cures was to drink a goblet of wine containing powder made from rubber, alum and garden crocuses. Another ‘cure’ consisted of a dose of Persian onions cooked in wine administered while shouting incantations. Other physicians prescribed sudden shock. There were other painful and actually harmful procedures. And all of these so-called cures cost money. So not surprisingly she is still very ill, still an outcast, and now either in poverty or on the brink because of her medical bills. She is desperate! If she is caught in this crowd, she could be stoned to death! Literally taking her life into her hands she works her way through the crowd, trying not to touch anybody or be touched. She finally gets close to Jesus and then she reaches out and touches him! And when she does she suddenly feels his healing power whoosh into her body. I love this! Note that with Jesus, the typical situation becomes reversed. When what is unclean touches him instead of him being defiled; instead of him getting the germs or the disease, he makes what is unclean clean; he makes what is defiled pure. Jesus with his power heals her and removes her uncleanness. But then much to the surprise of the woman, Jesus stops and begins to look for her. “Who touched me”—why does Jesus stop? Why does it even matter? It matters because Jesus does not simply heal like a vending machine. Sometimes people think that if one says the right words or goes through the right motions or conjure the right amount of faith, and then bing, just like a vending machine you have put in the right combination and what you have requested comes sliding down into the tray. But that is not how Jesus works. Jesus wants to know this woman. He wants to look her in the eyes. He wants relationship. For us it is not a matter of simply asking God for certain things and then if we get them, just going on our merry way. No, God wants relationship with us! I am convinced that part of the reason we go through struggles in life is because God wants our attention. God wants us to turn to Him! He wants relationship with us. Here in our gospel story Jesus wants to speak to her, to encourage her; he wants to comfort her. Healing the bleeding was only part of the solution; she needed his presence, his words, and his peace. It is of course the same way with us. We ought not to think in terms of formula; God wants relationship. Meanwhile there is Jairus. We need to understand that Jairus is an important man, wealthy, and influential. He does not need to beg for anything. Yet, yet, when it comes to his daughter, now he is desperate. Now he really needs something, someone beyond himself for help. As Jesus finishes talking with the woman who is now clean and healed, Jairus gets word that his daughter is now dead. He was told not to bother the teacher anymore. But Jesus tells him, “Do not fear, only believe.” So Jairus plucks up his hope and they continue to his house. The mourners are already wailing. Jesus says to them, “Why are you making such a commotion and wailing? The child is only asleep! They laughed at him. “Get out!” Jesus tells them and puts them outside. Then he goes to the daughter’s room. Jesus then takes her hand. Jesus picks up a dead person’s hand; that is significant! You see, the dead were also unclean. And Jairus would know the rules. He is seeing Jesus break the taboos to touch his daughter. When the dead are touched the person touching is now unclean at least for a time. In those days, the Rabbis were particularly careful to remain ceremonially clean. In that religious society they were the pillars of the religious establishment. Everyone looked to the Rabbis to see how to live and how to obey the laws of God. So it was important that they especially avoided all contact with what was unclean. Again, Jesus does what is totally unexpected. He actually touches the dead girl’s hand; and he doesn’t just touch it, he grasps it and pulls her up and says “get up.” And she does! She comes back to life. Again, Jesus reverses the flows—what is unclean becomes clean. Rather than Jesus becoming contaminated he cleanses. The light pushes out the darkness. The clean cleanses the dirty, Life restores from death. So what is the point? What can we learn from this segment of a day in the life of Jesus? First is to recognize what Mark the Gospel writer was trying to convey, to see Jesus as the God-man—the one able to reverse the natural order and make the sick well, the unclean clean, the dead back to life. And another lesson is what the early church learned, which was was to care for the sick. In the first century world when a person got sick with an infectious illness he or she was simply abandoned. If contagious sickness li began to spread through a city, the wealthy and everyone else who could would simply leave the city and go somewhere else to live and leave the sick and dying to care for themselves. The dead were left to rot in their beds or on the streets. But what happened as Christianity spread was that the Christians would stay. They would stay and care for the sick. They would stay and bury the dead. They would stay with those who had been deserted; they stayed with those who were the unclean, the contaminated. Was it because they thought they would be imperious to the sickness? No, many Christians died as a result of catching sicknesses. Yet, many survived and many of those non-Christians who had been deserted survived as well. This had an enormous impact in the ancient world. This has been a Christian legacy throughout history. Christians established hospitals and leper colonies. It was the Christians who began to care for the wounded soldiers. It was Christians who began the orphanages and cared for the abandoned babies and children. What about us? For us we need to reach out to help those who are the so-called unclean. And we do here at St. Andrew’s! We do visit the sick and the dying. We do help those who are in need of food, in need of clothing and other necessities. I encourage you to get involved in helping at our thrift store. I encourage you to get involved in helping at our food pantry. I encourage you to get involved in our pastoral ministry. If you desire, you can get involved by contributing to the Rector’s discretionary fund. 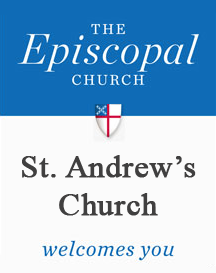 It is out of that fund I, in St Andrew’s Episcopal Church name, help people in our church and in our community with their electric, or water, or rent bills.